SOLITINE's modular data center is a smart and flexible architecture suitable for small and medium enterprise applications. In addition to the integration of main systems of power, cooling, racks and monitoring, the cold or hot aisle containment also provides superior air flow management to enhance cooling efficiency. A traditional datacenter takes 18 to 24 months to build, while a modular data center requires only a few weeks or months for deployment. SOLITINE's modular data center, with its fully modular design concept, is flexible and offers pay-as-you-grow with short installation time to meet the rapidly growing needs of data storage and processing. Suitable for small and medium enterprise applications. Standard module for high reliability. N, N+1 or 2N configurations are available per customer needs. Up to Tier 4 of TIA-942 standard. UPS, power distribution, battery, cooling, racks and more are integrated. Small footprint leads to high space utilization. RowCool can meet either low, mid, or high power density requirements and saves space. Hot/cold aisle containment improves cooling efficiency. 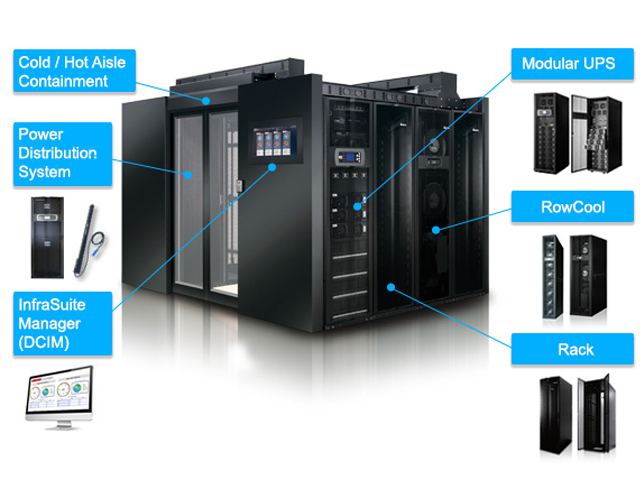 Highly efficient modular UPS even at light loads. Free cooling is applicable if weather conditions permit.